A Hall & Woodhouse pub in Soho, just off Carnaby Street. As expected from the location, this place can get extremely crowded, generally later in the evening and usually spilling out into the street, though there are plenty of tables down into this dark and narrow pub (alleviated somewhat by the skylight in the rear). It can be a bit of a mission trying to squeeze through to the bar area when it's full. 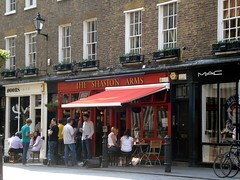 However, the bar staff are friendly and the beers are dependable and well-kept. They have three ales on handpump, which in January 2015 included Tanglefoot (£3.95/pint) and First Gold. There was no sign of food on our June 2008 visit. Accessibility: A step to get in. Another step down to the seating area at the back. Narrow access to the bar. Toilets down a flight of stairs. Last visited by bob et al., January 2015. Opening hours taken from the Shaston Arms website, January 2015. Last edited 2015-01-15 08:51:59 (version 6; diff). List all versions. Page last edited 2015-01-15 08:51:59 (version 6).